How long has it been since you opened that box of Crayons and saw all those new shiny coloring points in the big yellow box? I know I always wanted the HUGE Box of Crayola’s but we couldn’t afford that one so I got the one that the school asked for with the supply list. Now that I’m grown up I can get the BIG Box… so I did. For the brand new colorist, I HIGHLY recommend this book if you want to learn techniques and go beyond the simple filling in of color. Inside this friendly guidebook, you’ll find plenty of easy-to-follow advice from best-selling coloring book artists. Their tips and tricks will have you drawing like an accomplished “colorista” in no time. Discover the differences between gel pens and marker pens. Learn the best way to use watercolor pencils. Understand why expensive materials are different from those that are cheaper. Master exciting techniques like patterning, blending, cross-hatching, shading and other cool ways to “up” your coloring experience. It is published by Design Originals and the editors of DO Magazine. Remember the smell of that new box of crayons the first day of school? Go for the biggest box or 96 Crayons, if you don’t like them they’ll be perfect to let the kids or grandkids. There are some spectacularly detailed coloring books being produced just for adults that you are sure to fall in love with. There are so many to choose from you will get lost on Amazon as I did. My dad used to enjoy painting scale model airplanes and I even found him some coloring books with World War I and WWII airplanes and tanks along with an Audubon Bird Coloring book. These coloring books for adults have some very fine detailing in them that really needs either fine-tipped markers or colored pencils. Gosh you mean I need some more art supplies? That makes me a happy camper. You are fine starting out with Crayola Pencils just to see if you like that medium. If you decide you love them as much as I do depending on your budget you will want to upgrade to Marco Raffine, Prismacolor Premiere or a big upgrade to Faber-Castell Polychromos. You can also play with watercolor pencils. I love Derwent watercolor pencils . You can put a dab of water in the center of a flower and get some really neat effects without all the mess of real watercolors.. and by a dab I mean I put my finger in my mouth and rub it around. This is for having fun, not for becoming a professional artist. Derwent Inktense colored pencils are more like paint in a stick form and just like the name says the colors are very intense. (Since I wrote this I’ve learned much more about pencils, please read my Best Colored Pencils & Watercolor Pencils articles linked here. You are going to want at least a few gel pens and I’m particularly in love with the ones that sparkle, and shimmer from Sakura’s gelly roll pen line. You DO need to be careful to let them dry a few moments before you touch them or they smear but they dry quickly and look just lovely on the page. Below I’ve listed some of my favorite coloring books (So far) along with my favorite supplies for you to check out. Joanna Basford’s two coloring books are an absolute delight! 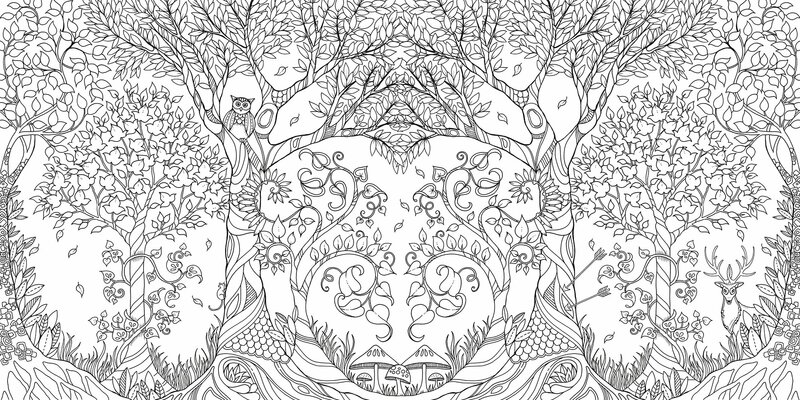 I still don’t have Enchanted Forest but it’s on my wishlist because the one I DO have “Secret Garden ” is so completely beautiful you save it for your favorite time of day to color in. Each page has fine details and she hides forest creatures throughout that you will love discovering as you color. This magical coloring book by Johanna Basford takes colorists through an enchanted forest to discover what lies in the castle. Similarly interactive like SECRET GARDEN, ENCHANTED FOREST also features hidden objects and fun mazes. Beginning at the entrance to a fairy-tale forest, the journey progresses through highly embellished woods and through intricate flora. Castles, treasure chests, and other magical elements add a fairy tale narrative to the designs. Special features include a gate-folded two-page spread and a colorable jacket. Secret Garden was my first coloring book and I just adore it! This magical coloring book by Johanna Basford takes colorists through an enchanted forest to discover what lies in the castle. Similarly interactive like SECRET GARDEN, ENCHANTED FOREST also features hidden objects and fun mazes. Beginning at the entrance to a fairy-tale forest, the journey progresses through highly embellished woods and through intricate flora. Castles, treasure chests, and other magical elements add a fairy tale narrative to the designs. Special features include a gate-folded two-page spread and a colorable jacket. The jacket also has some shiny golden details. It is just a beautiful book you are going to want ASAP. I share my coloring book pages on Instagram so please come follow me there. CREATIVE HAVEN has the most budget-friendly option with most of their books around $5 on Amazon. If you have a cat lover in the family you are going to want to get “Creative Cats“. The great thing about most of the Creative Haven books is that the coloring pages are one-sided so if things bleed through, you haven’t ruined the page below. I still recommend you tear the page out or put a piece of paper behind just in case the markers you buy bleed through. Many of them do, so test that first. I’m pretty sure I need at least one of the coloring books by Millie Marotta, She seems to combine Zentangle and coloring into one book. If you prefer flowers you might like this book by Jenean Morrison. Pages are printed on one side only so if you like to use heavy markers you can just put a piece of paper behind the page you are coloring so as not to disturb the design beneath. This unique coloring book takes all sorts of artists drawings and illustrations and plops them into this book. The Dover Nature line of coloring books is VERY inexpensive. Good Old Crayola Colored Pencils work great too for those of us who may or may NOT really know the difference, and the price point can’t be beaten. 50 Pack of Long Crayola Colored Pencils under $15 bucks. Do watch out that you don’t get short ones or classroom packs that don’t have 50 different colors. These are an excellent value for sure and a great way to let your kids and grandkids color with you without worrying about them ruining your expensive pencils. Twistable Crayola Crayons are also lots of fun and you don’t have to sharpen them. Faber Castell Polychromos are fabulous, oil based colored pencil that gives you the deepest colors, the best blending and the smoothest application out there for the very detailed books. If you are a Johanna Basford fan then you are going to want the largest pack of these you can afford. I STRONGLY recommend downloading the Hobby Lobby, Michaels and Joann’s App to your smartphone. That way you always have the coupons with you. Being the clumsy person I am.. I ALWAY forget the coupons at home or in the other car or the other purse.. you get me. right? I’ve also heard wonderful things about Lyra Colored Pencils but haven’t used them myself. Getting started with Adult Coloring books? Check out this Supplies for New Colorists and the top 13 tips you need to know.